Johnny Appleseed was born on September 26, 1774 and died February 18, 1845. His name at birth was John Chapman. He was an American pioneer nurseryman who was responsible for the introduction of apple trees to large parts of Ohio, Indiana and Illinois. He would become an American legend while still alive, mostly because of his kind and altruistic ways, his championing of conservation, and the symbolic significance of apples. John Chapman was the second born child of his parents Nathaniel and Elizabeth Chapman. His parents married on February 8, 1770. Tradition has stated that Nathaniel lost two prosperous farms during the American Revolution however, it has been found that Johnny’s father was a farmer of little means. Additionally there is no deed record or actual proof that either property existed or belonged to his father. Nathaniel started John Chapman on a career path as an orchardist by apprenticing him to a Mr. Crawford who was the owner of apple orchards. His parents had a third child, Nathaniel Jr. who was born on June 26, 1776, during the period that Nathaniel was an officer leading a company of carpenters associated with General George Washington’s forces in New York City. However, Elizabeth was ill with what may have been tuberculosis and both mother and child died soon after in July, leaving John and his older sister, also named Elizabeth, to be raised by relatives. After Nathaniel was honourably discharged in 1780, he married Lucy Cooley, with whom he had ten more children. 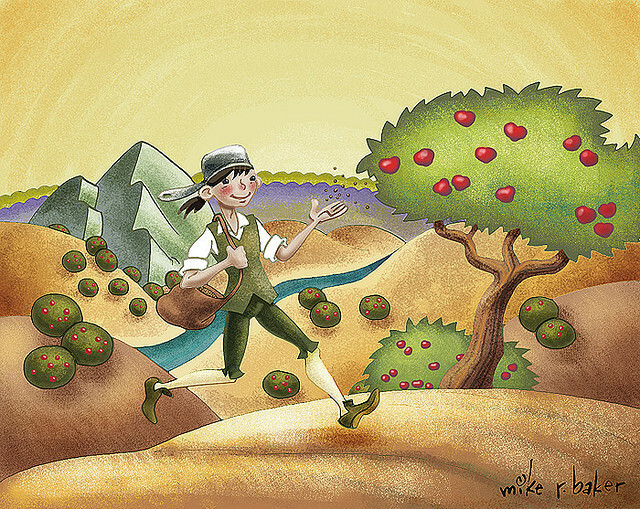 It was traditionally thought that Johnny Appleseed simply spread apple seeds randomly, wherever he went. However, he was more pragmatic planting nurseries rather than orchards and building fences around them to protect them from being affected by livestock. He left the nurseries in the care of a neighbour who sold trees on shares. He re-visited every year or two to tend to the nurseries he established. A great majority of these nurseries were established in the Mohican area of north-central Ohio. This area was comprised of the towns of Mansfield, Lucas, Perrysville, and Loudonville. Appleseed’s managers were sometimes asked to sell trees on credit, if at all it were possible, but he would willingly accept corn meal, cash or used clothing as a form of barter trade. The notes did not identify an exact maturity date, that date may not have been convenient, and if it was not paid promptly, or paid at all, Johnny Appleseed would not press for payment. Appleseed was not the only businessman who indulged in this method of doing business, but he was a typical for remaining a wandering soul for the duration of his life. He would acquire the apple seeds free; cider mills desired more apple trees to be planted since it would undoubtedly produce a greater inflow of business for them. Johnny Appleseed donned the worst of the used clothing he received and gave away the better clothing in barter. He went shoeless most times, even in snowy conditions. He was very benevolent and even more generous having nothing for himself to maintain. When he discovered that a horse was to be put down, he would buy the horse, buy a few grassy acres close by, and allow the horse to recover. If the horse recovered, he would give the horse to a person in need, asking only that he treat the horse humanely.